Also known as the Ski Lodge, Walters Hall has a warm and inviting interior lobby with plenty of space for socializing, programs, and studying. Conveniently located next to EKU's Caffeinated Colonel Coffee Shop, Walters Hall is just a short walk to the Case Dining Hall, Historic Ravine, and the Crabbe Library. 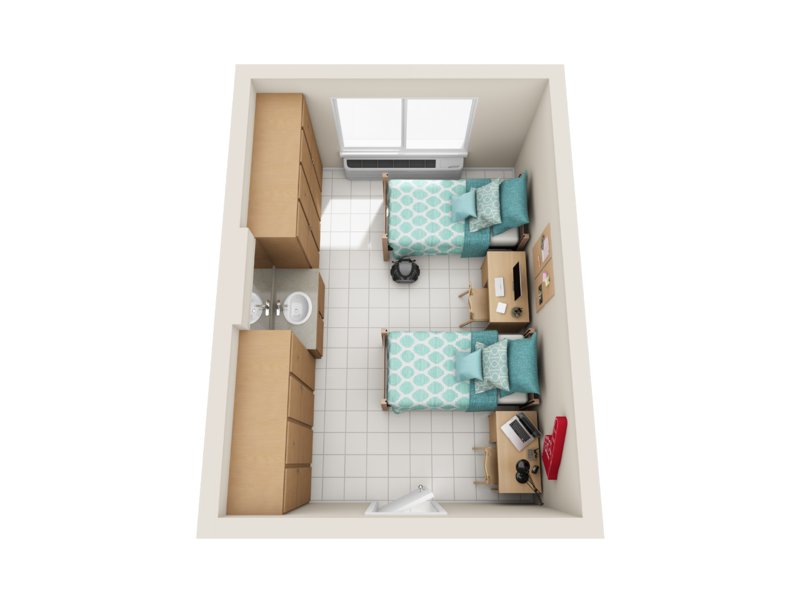 Below you can view an example room layout for the styles offered in Walters Hall. Please note, these layouts do not reflect the exact room style and should be used as a general reference. Because of the varying sizes of spaces, exact dimensions for specific spaces are not available. Walters Hall offers Enhanced Traditional spaces which house two residents, include a sink in the room and a community bathroom. Enhanced Traditional spaces offer affordable living in a close-knit community where students get involved and easily engage with others. Below are the standard room dimensions for Walters Hall spaces. Please note, spaces vary by size and the below dimensions are reflective of a typical room and to be used as a reference only. Exact dimensions for a specific space are not available. Walters Hall also offers community computers and printers, two TV lounges, a free laundry facility on the lower level, and a community kitchen or kitchenette on every floor of the building.